When a senior Papuan politician said recently that Papua was not ready for democracy I was mildly shocked. “The people are not mature yet, neither are the political elite. They are not ready to accept defeat, which results in them resorting to violence. Organizers of elections in the regencies are terrorized and intimidated. People are prone anarchic acts,” Yop Kagoya, the deputy speaker of Papua legislative council,told the Jakarta Post. Looking for news about the Wamena incident, I came across the full-page ad pictured above. 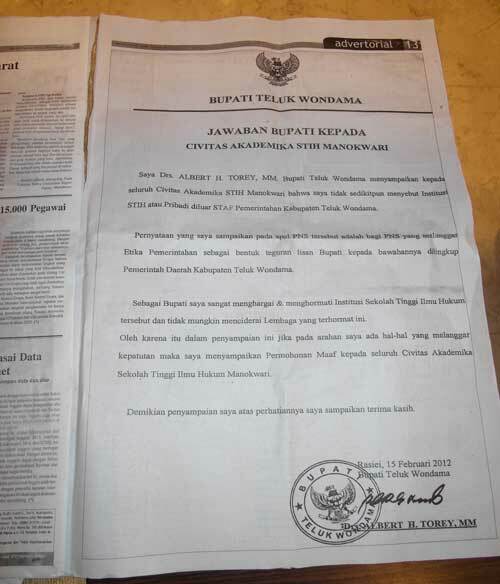 It was taken out by the Bupati of Teluk Wondama district, Albert Torey. He’s apologising to the graduates of a local institute of higher education for calling them all “gutter-snipes” (more specifically, he said they had crawled out of the Konto river, a stinking, garbage-strewn drainage canal in the West Papua provincial capital of Manokwari). His comment was apparently prompted by his disgust with his running-mate, the Vice Bupati, who is a graduate of the school. The Vice-Bupati ran the shop in Teluk Wondama for the eight months that the good Mr. Torey spent in rehab for drug use –he and his wife were caught taking meta-amphetamines last April. According to local journalists I happened to gossip with in a cafe in Manokwari, Mr Torey (now comfortably back in office) is snarky because his deputy did such a good job when he was away. Nothing like a bit of good governance to make your superiors uncomfortable. The college was so upset by the gutter-snipe comment that it threatened to sue for defamation unless the Bupati printed an apology. This is a slightly more grown-up way of dealing with conflict than reaching for the bows and arrows, but it still smacks of kids fighting in the sand-pit. Needless to say, the constant squabbling and even outright violence that appear to be the hallmark of Papuan politics are a drag on development. As much out of habit as anything, Papuan voters still tend to blame development failures on the wicked government in Jakarta. But sooner or later they are going to have to take a closer look at their own leaders, and indeed their own behaviour, and ask themselves what role they play in holding back development in one of Asia’s richest territories.